It depends where you are. In Canada it's often the first boat we use; a double ended craft made of cedar and canvas or more often now of composite or cedar strip and fiberglass. Moulded plastic canoes have become increasingly popular also. It is typically powered with paddles but sometimes a sail is rigged. Occasionally a canoe is made with a narrow transom to accommodate a small outboard. Modern day canoes are based on native designs which were often made of bark, in particular birch bark. Unlike row boats, canoes are paddled facing forward. Historically many boats have been called canoes: dugouts and any number of small double ended paddled boats, pirogues and small fishing crafts. Kayaks and decked canoes were also sometimes referred to as canoes, particularly in England, and the terms Canadian Canoe, Peterborough Canoe or Chestnut Canoe, is still sometimes used for the open touring style of canoes to distinguish it from kayaks. Canadian style canoes were not only found in Canada but were being built in the northern US states as well. In the world of racing, canoes tend to be very similar in shape to rowing sculls except that they are paddled rather than rowed. They are long, thin boats with very little free-board and are designed for speed and lightness rather than stability. Traditional canoe with cedar wood frame and painted canvas covered hull made by the Peterborough Canoe Company in Ontario Canada. Chestnut Canoe also made traditional style canoes. Here Bill Mason is photographed paddling one solo. Theodore Roosevelt owned a Chestnut Canoe. Many of the old canoes could be ordered with a sailing rig. Canoes are often built using the strip method Usually Cedar strip is used and once the shell is built it is covered in a clear fiberglass coating. The result are stunning very light canoes that are much stronger than they look. The first scratch is a very painful experience for the builder, the canoe is not harmed. The Swift Canoe and Kayak Company makes quality modern composite boats. They have lovely Kevlar crafts that weight in at about 30 pounds. They have also experimented with many other materials including flax fiber and carbon fiber. How does the shape of the canoe influence it's performance? There are many factors influencing performance, Length, Width, Depth, Rocker, Keels, Tumblehome, shape of Bow, Shape of Bottom. No single canoe is perfect for all uses. As usual it depends on what you want. Speed is another measure for efficiency of effort, more of your horsepower is used to move the boat forward. Generally the longer a boat is, the faster it can be and all other factors being equal, a longer canoe will be faster. Longer canoes will also track better than shorter ones. Longer canoes are less maneuverable and take more room to turn. They can also be heavier particularly if they are loaded with more gear. Since they are longer they can carry more. The narrower a boat is the less it is stable so this needs to be balanced with safety. The width of the canoe also makes a difference in how fast it can go. Narrower is faster. The shape of the front and how pointy it is also has an effect on efficiency of the boat and thinner pointier fronts are faster than more blunt boats. Windage is a factor in speed. If you have high sides and are trying to paddle in high wind you will have a tougher job controlling and moving your canoe if you have high sides than if you have a lower sided boat. So overall smaller freeboard is faster. The shape of the sides also influences speed. It's easier to paddle a boat that flares out or has a straight side than one that curves back in (tumblehome). You have to reach further out to stroke if there is a lot of tumblehome. This is more pronounced in the bow position than the stern position. Tumblehome in a canoe also helps make a stronger structure. A flat structure is easier to bend than a curved one. Because flatter boats with little rocker track better they will be faster than boats with a lot of rocker. When there are a lot of waves then rocker is useful however. Rounder hulls are faster than flat hull but this comes at the cost of stability where a somewhat flatter bottom is easier and more forgiving. Many touring canoes have built in shallow keels that improve tracking and keeps the canoe going straight. These can help too if you decide to rig up your groundsheet and paddles and make a sail to drift downwind in a lake. Carried out to the extreme all these "fast" charactistics add up to a racing canoe. It is long, pointy and narrow, with low freeboard and no rocker. It is fast at the expense of everything else. In moderation these features make for a lovely efficient touring canoe that is easy to paddle, tracks well and because of its size, can carry some freight. What if you are planning to explore winding little streams or go down rapids, speed is not all that useful. You are looking for a boat that can turn on a dime to get around a log or a rock and that might plunge its nose in a dip when going down a rapid and not take on too much water. The opposite features from a fast canoe are needed. Where a 16-17 foot canoe is a good touring size, shorter canoes do better in rough or winding conditions, 14-15 feet is a good size. Stability is more important so a wider shape with higher sides is helpful. A bit of rocker will make the boat easier to turn. Rocker is the curve of the hull as you look at it horizontally. If it rocks on its bottom front to back then it has rocker. Although flatter cross section bottoms feel more stable and have significant initial stability, they have poor secondary stability so a slightly more rounded bottom is better if you have to lean over as you paddle, such as in white water. Higher bow and sterns are also useful features if you plan to run rapids. It's not unusual to plunge your nose in a trough and if your boat has low ends then water might come in. High sides can catch the wind so increase windage, but that's not important for protected water. In rapids, safety becomes an issue and many canoes used in rapids will either be covered or will have large boyancy tanks or inflatable inserts. Rapids can subject a canoe to some stresses not seen in gentle open water and the construction of the canoe should reflect this. Strength comes at the cost of weight but this is less important if you are just exploring or going down white water. What Makes a Canoe Stable? For many people, particularly beginners, stability is the most important feature in choosing a canoe. Many things influence stability. The shape and width of the hull have the most influence. 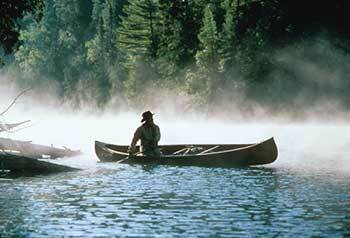 A wider canoe will be more stable than a narrower one. The shape of bottom, the hull profile, has the most influence on how stable the canoe feels and actually is. A canoe with a flat bottom feels very stable. It has very hight initial stability. It is easier to board and does not lean as much as other rounder shapes. If it does lean however it has more of a chance of going over. Although this shape has great initial stability it has limited secondary stability. Once you start going over it's difficult to recover. It also is more sensitive to waves and wind. Because of this poor secondary stability resourceful canoe manufacturers have added large floats to the gunnels of some wide flat bottom canoes to improve the secondary stability. It makes an ugly boat but solves a problem. At the other side of the spectrum, a very rounded bottom feels very tippy. It dances and leans with every move you make. This makes the boat very responsive but you have to pay attention. It has low initial stability but if you do lean and try to tip the canoe it will resist you. Rounded bottoms have a surprising amount of secondary stability. It is not surprising that most people choose a boat with some curve on the bottom but not completely flat. Manufacturers offer a wide range of shallow curves to cater to a wide range of requirements. Various shapes have been tried including a somewhat v shaped bottom. This shape tracks well and has a good balance between initial and secondary stability but makes for a larger wetted area which makes them slightly less efficient to paddle. The bottom of the v is also vulnerable to scrapes and damage. There are many designs for plywood boats. They range from canoes that have only 1 boards per side and a completely flat bottom, such as pirogues, to almost fully rounded profiles that are almost perfectly smooth. If you decide to build a canoe using the stitch and glue method, then decide before hand what features you want and look for a model that will perform as you expect. Look for length, width, rocker, freeboard, height of front and back, shape of hull. Many very successful boats have been put together with plywood. Many people chose to build canoes using cedar strips, this makes gorgeous crafts with lovely smooth lines: Strip building plans. Geodesic Aerolite has plans for ultralight canoes and many other boats. This boat weights about 20 pounds. At the other end of the spectrum, some of the older wood/canvas canoes can approach 100 pounds in weight. Most canoes come in at less than that. The development of strong modern composites has made it possible to make very light boats. There are some advantage to a heavier boat though. Although not so easy to transport and store, heavier boats have more intertia and tend to glide on between strokes. they are also less sensitive to windage. Really light boats are sometimes more difficult to get into, speaking from a somewhat stiff old lady point of view. 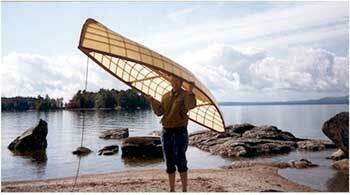 A heavier canoe will often give a smoother ride because it slices through waves rather than sitting on top of them. Some ultralight boats are less stable. There is simply not enough weight to settle the boat. Some ultralight are steady and well behaved though. Just make sure you know what you are building. Many of these boats are light enough to be carried on a car rack on top of a car. Any boat or combination of boats, over 100 pounds is getting quite heavy for a cartop. Make sure you have good tie downs. and if your boat overhangs the car put a red flag too. Canoeing.com has a page on the different types of canoes. Some Paddles. I also have several plans for paddles and oars, some free: Free oar and Paddle plans page. If you're interested in putting a sailing rig on a canoe this is the book for you. Great illustrations too. I don't claim to be an expert in anything. Do your homework first.